The morning after from getting fully equipped from the ski store is a very exciting time because you get to use the skis and see if you can rise to the challenge, I felt like a kid on Christmas day. I was fortuitous because the company that brought me out to Morzine also treated me to a ski instructor. Now, before I go straight into the action I feel I need to give you some valuable advice, as that’s my job with this guide. Make sure you have breakfast before leaving your chalet, you will burn a lot of energy very quickly and no one wants to be the weak link or the spoilsport of the group. Please make sure you fill up before leaving. I made a crucial mistake when I went to my first ski lesson and that is I forgot to bring water with me. I’m telling you from firsthand experience that you will crave water whilst out on the slopes. Food and drink is an essential please don’t try and skip any of this, you will regret it. By now you will be in your ski kit and have all your equipment on you, ready to make the climb up to the top of the slopes. You can get the cable carts up there that’s not an issue but you need a ski pass to use them, adult passes range from €44.50 – €900 depending on whether you want a 5hour or a season pass, prices can vary depending what region you’re in. When I arrived on the slopes the only information I knew about my instructor was that his name is Grant and that he will be wearing all yellow. Which at the time I didn’t realise the complications this could have, and it was only when I seen the hundreds of skiers that it dawned on me. My lesson was meant to be at 11:00am and I ended up not starting it till 12:30pm because we couldn’t find each other but with a bit off luck and a phone call we managed to get it together. Grant McNaughton is an instructor for New Generation Ski School, who I would highly recommend. We started off putting one foot in a ski and keeping the other one free from the ski. The point of this exercise is to get a good indication of your balance but also to get a feel for the ski. The next part major part to your ski lesson and the hardest technique for a beginner is the snowplough. This is where your ankles need to spread as far apart as possible but your toes need to be as close as they can without touching, this will then control the speed you go at down the slope. It took me a lot of attempts just to get it at an average standard but with a lot of grit and perseverance I managed to progress. I will admit that it took me a lot of walking up the slope just to go again and your feet start to go numb from the boots after a couple of hours. Once you progress on you start to learn how to turn and then things start to get interesting because you can really see the how well you’re doing. Grant was very encouraging and I felt that he was with me every step of the way and as an instructor he was faultless. Lessons for beginners in Morzine cost between €79 – €99. I must touch upon something said in the First Time Skiers Guide – Part 1, I was wrong to ever think that the dry slope for skiing would help me. Overall the experience of learning how to ski was a most memorable one and I would encourage everyone to at least try it once. You will ache, crash and fall but like the saying goes ‘no pain, no gain.’ On my last turn down the slope before the end of the lesson, I opened pointed my toes down on the skis too fast and came to a crashing stop where my shoulder plunged into the snow but you just have to pick yourself up and go again. Morzine really has everything to offer for the best first time skiers holiday, the chalets are beautiful, the town fantastic and the ski resort is up there with the best. Although if you’re out drinking avoid the beer Mutzig it’s lethal at 12%! This entry was posted in adventure, blogs, ChaletFinder, David Cameron, Europe, exercise, First Time Skiers Guide, France, Journalism, Journalist, lifestyle, Morzine, Mutzig, New Generation Ski School, Portes Du Soleil, Reece Chaplin, RudeChalets, Ski, SkiSet, snow, Snowboarding, Sports, Sports Journalism, Travel Blog, Uncategorized and tagged Chalet, ChaletFinder, First Time Skiers Guide – Part 3, Learning to ski, Lift Pass, Morzine, Mutzig, New Generation Ski School, Reece Chaplin, Ski, Ski Instructor, Ski lessons, Ski pass, snow, Snowboarding. Once we landed in Geneva and collected our baggage we were greeted by Ollie who is a representative for ChaletFinder. He drove us to our chalet and provided us with a document to go and collect our ski equipment and passes. But before we arrived at our accommodation we were taken to an iced over lake called Lac de Montriond which supplied us with the most peaceful and breathtaking of scenes. It was just utter bliss. After settling in and unpacking at the chalet we headed down to SkiSet who are a traditional and local company with stores based all around the resort. You can buy and rent skis, snowboards and mountain bikes from them and they were the ones providing us with our equipment. The first thing they got me to do after telling them I’d rather ski than snowboard was measure my feet to fit the boots. It’s a bizarre feeling when you put them on for the first time because they are very tight, to say they were a snug fit would be an understatement! Also they instantly make you lean forward, which is a good thing, as that will help you when learning to ski. It’s like having a pair of ice-skates as boots, that’s the best way to describe them. I’m just giving you the heads up now so you know what to expect. Also whilst we are on the subject of the ski boots, I would recommend not trying to walk down steps or anything that can easily put you off balance as I nearly found that out the hard way (phew). The next step is they determine what skis will suit you best. The way they do this depends on your height and weight and you will find that the length of the ski will come somewhere between your top lip and forehead. Although for beginners they tend to size the ski closer to your chin as it will help with being able to turn. This is what you can expect for your first ski fitting, as I don’t think many first time skiers would have a preference. Last but not least is being fitted with your ski poles. This is still an important piece of equipment but you don’t really concentrate on using them much when you’re a beginner. The snowplough is the key movement to grasp, as you will come to find out soon enough. Again the poles are based on your height and ideally your arm should be parallel to the ground when you hold the pole. Going into the shop and being kitted out with all the equipment really is a vital part of your journey to learning to ski. You will never forget this experience. This entry was posted in adventure, blogs, ChaletFinder, Europe, First Time Skiers Guide, France, Geneva, Journalism, Journalist, Lac de Montriond, Morzine, Portes Du Soleil, Reece Chaplin, RudeChalets, Ski, SkiSet, snow, Snowboarding, Sports, Travel Blog, Uncategorized and tagged blogging, Chalet, Chalet holidays, ChaletFinder, First Time Skiers Guide, France, Lac de Montriond, Morzine, Part 2, Reece Chaplin, Ski, Ski equipment, SkiSet, snow, Snowboarding, Sports, Switzerland, Travel Blog. Have you ever wanted to go on a skiing holiday but never had the opportunity to go; yet thought what’s all the fuss about and are you truly missing out… well stop searching and indulge yourself into this three-part blog where you will discover my journey. Hopefully you will be encouraged and see that opportunities are always there and it’s about taking them and making the most out of it. Let me give you some background information about me, and how my idea was brought to life. I’m Reece a third year broadcast journalism student at the University of Salford. I seen an advertisement on a social media website offering freelance journalists the chance to go out to France via ChaletFinder. I found this an offer I couldn’t resist so I pitched the idea of a first time skiers guide to the company and here we are. I just want to take this opportunity to thank them for seeing the potential in my idea. They really supported me and provided my flights, transfers to the resort, ski passes, equipment and the most amazing accommodation run by Rude Chalets. Shall we proceed to the beginning of this adventure? The day had finally arrived to fly out to Geneva and transferred to Morzine, Portes Du Soleil. I don’t think there wasn’t a mode of transport that I hadn’t taken that day. It took a tram and train just to get to the airport, then a plane to reach Geneva and then I was picked up and driven to the French town. Within the time of five hours I had been in three different countries. View of the alps from the plane window. We set off at 6:00am to catch a flight departing at 10:50am; my flight was from Manchester airport. ChaletFinder supplied my flight through EasyJet and before you ask the pictures of me in my bright orange jacket were a coincidence and not planned out. Although they complement each other well, as you will see in the photo below. After checking in all the luggage and camera equipment, Brad my camera operator and me thought it would be a smart idea to go and exchange our currency. A normal and straightforward process you’d think but that was far from it. Whilst we are at the currency exchange desk we deliberate what currency we should get because in our mind we were flying into Switzerland, so we exchange our money into Swiss Franks, forgetting to take into account that Morzine is based in France… and use the Euro! That’s what happens when you don’t start your day off with a coffee. We only realised that we exchanged the wrong currency when we were halfway from our destination and talking to another passenger on the plane about our journey. I would like to give a shout out to the lady who sat next to us in row 23 a, b and c. You were very polite in enduring us chatting away to you the whole flight and for the offer of an alcoholic beverage. It still hadn’t sunk in that I would be learning to ski in one of the best resorts in Europe. I’m going to be honest and tell you that before going out I felt confident that I would find it easy to pick up as I had done one lesson of dry skiing about five years ago when I was 17. I’m a very sporty natured person and extremely competitive, so in my mind combining these two attributes would surely only help me. This entry was posted in adventure, blogs, ChaletFinder, England, Europe, exercise, First Time Skiers Guide, France, Geneva, Journalism, Journalist, Manchester, Manchester Airport, Morzine, Portes Du Soleil, Reece Chaplin, RudeChalets, Ski, Sports, Travel Blog, Uncategorized and tagged adventure, Blog, ChaletFinder, Europe, First Time Skiers Guide, France, Geneva, Journalist, Manchester, Morzine, Portes Du Soleil, Reece Chaplin, RudeChalets, Skiing, snow, Student, Travel writing. A match, whom everyone thought would be cancelled due to the terrorist attacks in Paris on Friday night, has turned out to be an occasion that demonstrated solidarity. The French Football Federation decided the match would go ahead, and The FA backed the decision to have the game played. France would be welcomed at Wembley in a spirit of fraternity and defiance as an act to stand up to terrorism. Although France manager Didier Deschamps had offered his players the chance to pull out of the squad before they travelled to London because of the circumstances. Security has been increased in the wake of the Paris attacks, as the Metropolitan Police don’t want to see repeat scenes from Friday happening tonight. In a change of protocol, the away team’s national anthem was sung after England’s ‘God Save The Queen’. Over 70,000 people roared out ‘La Marseillaise’ as a tribute to the 129 victims of Friday’s attacks, England fans in the east side of Wembley held up cards which formed the French Tricolore. England was victorious winning 2-0. France’s captain, Hugo Lloris, thanked England’s fans for their support but admitted the French team found it hard to concentrate. “All of this has been very hard, but we played the match for our country and for the victims. Tonight was a moment of national unity,” said Lloris. The result was always going to be meaningless but the occasion couldn’t have been any different and will live in the memory for everyone who watched and attended the match. This entry was posted in England, Europe, Football, France, French Football Federation, Journalism, Journalist, La Marseillaise’, London, Paris Attacks, Reece Chaplin, Solidarity, Sports, Sports Journalism, Terror Attacks, Terrorism, Tricolore, Uncategorized, Wembley Stadium and tagged England v France, Football, French Football Federation, La Marseillaise’, London, Paris Attacks, Reece Chaplin, Solidarity, Terrorism, The F.A, Tricolore. After being banned from entering the UK for 10 years, Indian Prime Minister Narendra Modi received a red carpet welcome from the British government and Indian diaspora on Thursday as he began a three-day state visit to the country. However Modi’s visit wasn’t welcomed by everyone, and after the ceremony at Wembley stadium had finished, he and all his supporters were greeted by protesters who represented Indian minorities. There were more than 700 protesters from Kashmiri, Sikh and Indian Muslim backgrounds who gathered outside the stadium. “We are at this demonstration today to protest against Modi and the Indian government for their illegal occupation of Kashmir and the massacre of our people,” said Najib Afsar, the chief coordinator for Jammu Kashmir Liberation Council. The Awaaz Network is an alliance of organisations involved in the #ModiNotWelcome campaign. Indian Muslim Federation, Castle Watch UK, Southall Black Sisters and Sikh Federation UK are groups included in this allegiance. “This visit is one-hundred-per-cent all about trade, the event speaks for itself. He was banned from most of the west for 10 years and now he’s getting a royal air force display which says it all.” Said Jasveer Singh of the Sikh Press Association. Over 60,000 people attended the invitation only event and it’s the largest reception any foreign head of government has ever received in the UK. Both Modi supporters and protesters waved flags on the night but the symbols on them and the occasion couldn’t of been anymore different for what they represented. This entry was posted in David Cameron, Genocide, Ghandi, Human Rights, India, Journalism, Journalist, Kashmiri, London, Minority, Prime Minister Modi, Protest, Protesters, Reece Chaplin, Sikh, UK Welcomes Modi, Wembley Stadium and tagged Genocide, Human Rights, India, Indian, Kashmiri people, London, Minorities, Prime Minister David Cameron, Prime Minister Narendra Modi, Protest, Protesters, Sikh religion, UK Welcomes Modi, Visit, Wembley Stadium. 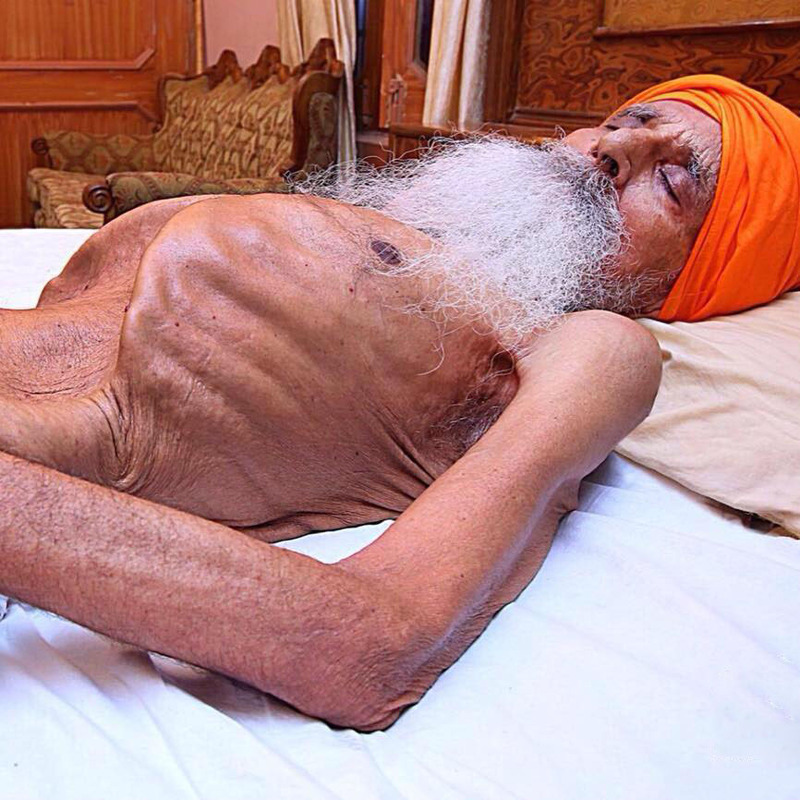 Bapu Surat Singh, 82 years old, who is a human rights activist is on a 277-day hunger strike in Punjab. Why? This is because Surat Singh is protesting for the release of Sikh and other minority prisoners who have served their sentences but still not been released. An issue such as this doesn’t just appear out of the blue, there would have to be a triggering point to push a person to the point of having to starve themselves to try to be heard. What would be this big bang that set of these chain of events? OPERATION BLUE STAR. Thirty years ago, in June 1984, Operation Blue Star changed the course of how Sikh’s would be affected in today’s India. Thus embedding the violence of this historic event into the heart of the Sikh religion. Operation Blue Star was a massacre orchestrated by the Indian Prime Minister, Indira Gandhi. She ordered the army to storm, with tanks, the holiest shrine of the Sikhs, the Sri Harmandir Sahib complex (also known as the “Golden Temple” in the west) located in Amritsar, Punjab on one of the holiest days in Sikh calendar, knowing the site would contain more people than usual. Eyewitnesses stated that people were allowed in but no one was allowed out, indicating an intention to commit mass murder, an intention that was subsequently achieved with thousands killed, although the government figures put the number of deaths in the hundreds, which are questionable when the sheer scale of the operation is considered. To comprehend the nature of this attack, an example would be if the Roman Catholics were a minority and the Italian army stormed the Vatican on the day of Easter on the orders of the Prime Minister. The government made it out to be the fault of the Sikhs, citing they did so to flush out alleged “separatists” and “terrorists” from the complex, notably Sant Jarnail Singh Bhindranwale, who empowered the Punjabi population, actively spoke out against government oppression and the lack of rights in the state of Punjab. The complex is open 24 hours a day but not one peaceful attempt was made to enter and arrest the so-called militants. Even to this day, no one has been put on trial for this heinous crime against a minority population. This operation led to Indira Gandhi being assassinated, which subsequently led to the 1984 Sikh Genocide in Delhi and numerous other anti-sikh government operations. Surat Singh’s starvation protest has been done in a passive manner, however the Indian police have handled this situation in a completely different way. The effects of his hunger strike have led to him being arrested and repeatedly force-fed. How can the police arrest someone when technically they haven’t committed any crime? Would that not be classed as an injustice or do they have the authority to do this because Sikh people are a minority in India. Surat Singh’s family have also been arrested, harassed and accused of crimes by the police. That leads me to question if the person were Muslim would that change the way we viewed this story? What I’m struggling to comprehend is how there has been very minimal or little media coverage on this topic from news organisations around the world, considering Mr. Singh’s hunger strike started on the 16th January 2015. The only press seems to be negative towards this movement and from newspapers such as Hindustan Times and Dailymail India who has labeled Sikhs as “hardliners” and described them as “terrorists” which is coincidental if you really think about it. To emphasise this point, inserted below is a video of the Mayor of London, Boris Johnson, responding when asked if he had heard of Surat Singh and his hunger strike. The Mayor replies “I will Google it,” this was filmed on July 16th, why hadn’t he heard of an issue of this caliber? Especially considering the established ties through the trade routes between the UK and India, you would think the Mayor of London would know issues such as this, which could affect morale. This entry was posted in 82 year old, Bapu Surat Singh, Genocide, Ghandi, Hunger Strike, India, Journalist, Minority, Operation Blue Star 1984, Protest, Punjab, Reece Chaplin, Sant Jarnail Singh Bhindranwale, Sikh, Starvation and tagged 1984, 82 year old, Bapu Surat Singh, Genocide, Ghandi, Hunger Strike, India, Journalist, Minority, Operation Blue Star, Protest, Punjab, Reece Chaplin, Sant Jarnail Singh Bhindranwale, Sikh, starvation.